Wanting to have the best New Year's Eve Party Celebration with Kids? Try these 5 New Year's Eve Ideas with Kids to have a fun and memorable Party Celebration! There are so many fun ways to include your kids in the New Years Celebration! Here is a round up of some of our favorites New Year Party ideas you can use to have the best New Year's Eve Party ever with the kids. Enjoy! Have the best New Year's Eve Party Celebration with Kids. 1) Double the Fun Parties wrote about her fabulous, kid-oriented, teal and silver New Year's Eve Party! She has fantastic ideas from the decorations to the food. She also includes some very fun activities - like "Name that Oreo." Her re-purposed coffee drink glass bottles as adorable milk bottles for the kids are my favorite! Seriously, how cute is this?! She has popcorn balls, veggie and dip cups, and other finger foods! The color theme with the clocks is just darling! 2) The Real Thing with the Coake Family posted this clever party plan! There are several variations online with other ideas but her plan is really cute and fun. Here are some more party ideas for kids. 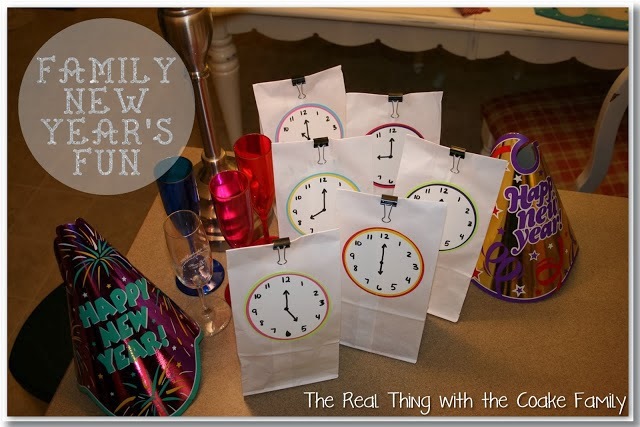 Ring in the New Year with Hourly Bags! Each bag is labeled with an hour (she includes a free printable on her site) - to be opened on each hour leading up to midnight (or whatever you deem to be your "ringing in the new year time"). She has a clue for an activity and something in each bag - hop over to her site for more details. So fun! If you are crafty and prefer a craft activity for each hour, check out these 16 ideas a clever New Year Activity with kids! 3) The Crafty Crow shared some ideas and this one is especially awesome! The picture is form flickr by Art Yowza. 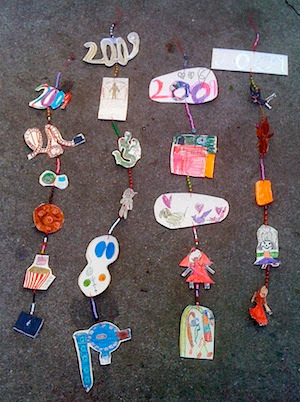 What a great way to use art in helping your children to reflect on the activities, events, and favorite moments of the year. You can provide art supplies, perhaps some number printables, and string and let them go to town in creating a keepsake craft project! 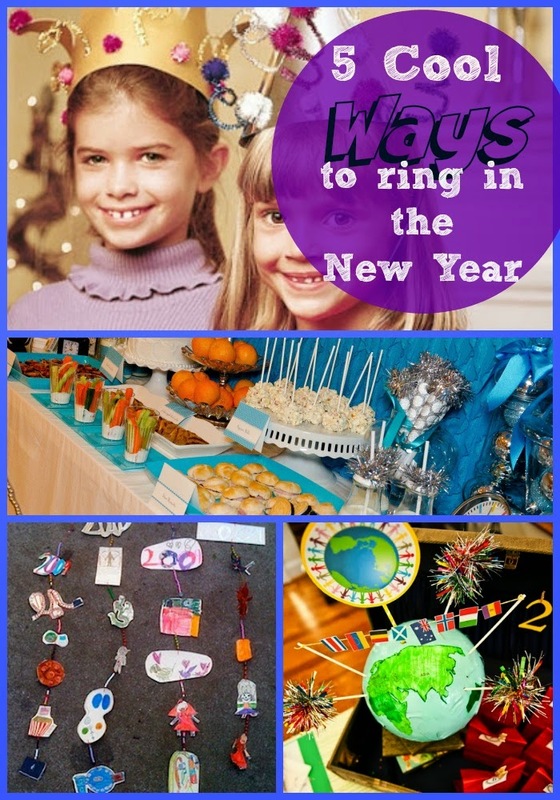 4) Savvy Sassy Moms has a wonderful round-up of New Year's party ideas! Fun DIY Hats for New Year's Eve. 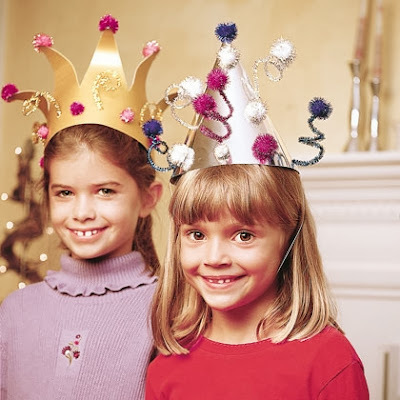 This is an especially cute idea from their list - these festive and fun party hats made from poster board. Pair these with little goodie bags filled with noise makers and you will have a rockin' party! All of the instructions are over on Spoonfull for these diy NYE hats for kids.! 5) (cool) progeny has perhaps my very favorite theme - New Years Around the World! There are several countries with their New Year's traditions listed! 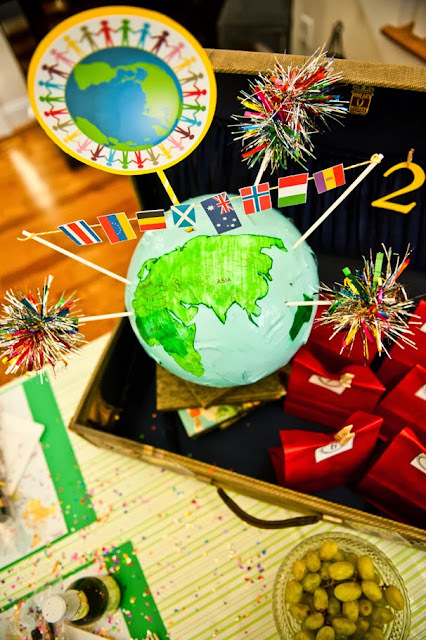 It would be such a fun way to incorporate a little history and geography into an evening of fun! You can find printable maps and coloring pages online as well as traditional recipes. Perhaps include traditional costumes or a learn a greeting in another language. You can compare when they ring in the New Year compared to where you live and perhaps celebrate several New Years! However you decide to celebrate - we hope that it will be a memorable and fun time with family and friends! Be creative in including your children - there are so many fun ideas! We would love to hear your ideas for New Year's Eve for kids. Do you stay up until midnight? Try this Midnight Care Package for your New Year celebration. Do you let your kids stay up? Any traditions that you must absolutely include? Find more ideas for New Years Eve.